An acid dye is a type of dye that is applied from an acidic solution. In the home or art studio, the acid used in the dyebath is often vinegar (acetic acid) or citric acid. In textiles, acid dyes are effective on protein fibers—particularly animal hair fibers such as wool, alpaca, and mohair. They are also useful for dyeing silk. They are effective on nylon but not on most other synthetic fibers. Acid dyes are generally divided into three classes, based on fastness requirements, level dyeing properties, and economy. The classes overlap and generally depend on the type of fiber to be colored and the process used. Acid dyes are thought to attach to fibers by ionic bonds, hydrogen bonds, and Van der Waals forces. They are normally sold as the sodium salt, therefore they are in the form of anions in solution. Animal protein fibers and synthetic nylon fibers contain many cationic sites, therefore there is an attraction of the anionic dye molecule to a cationic site on the fiber. The strength (fastness) of this bond is related to the tendency of the dye to remain dissolved in water vis-a-vis its tendency to be fixed to the fiber. The chemistry of acid dyes is quite complex. 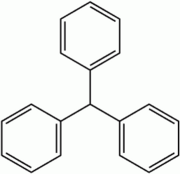 Dyes are normally very large aromatic molecules consisting of many linked rings. Acid dyes usually have a sulfonyl or amino group on the molecule making them soluble in water. Water is the medium in which dyeing takes place. Many acid dyes are synthesized from chemical intermediates which form anthraquinone-like structures as their final state. Many blue dyes have this structure as their basic shape. The structure predominates in the leveling class of acid dye. The structure of azo dyes is based on azobenzene (Ph-N=N-Ph). Although azo dyes are a separate class of dyestuff, mainly used in the dyeing of cotton (cellulose) fibers, many acid dyes have a similar structure. Most are red in color. Acid dyes having structures related to triphenylmethane predominate in the milling class of dyes. There are many yellow and green dyes commercially applied to fibers that are related to triphenylmethane. Equalizing/leveling acid dyes: They have the highest level dyeing properties and are quite combinable in trichromatic shades. Their relatively small molecules allow high migration before fixation. However, they have low wet fastness and are normally not suited for apparel fabric. Milling acid dyes: They have medium to high wet fastness, and some (in pale shades) have poor light fastness. These dyes are generally not combinable. Metal complex acid dyes: More recent chemistry combined transition metals with dye precursors to produce metal complex acid dyes with the highest light fastness and wet fastness. These dyes are also very economical. They, however, produce duller shades. Any dye, including any acid dye, has the ability to induce sensitization in humans due to the complex molecular structure and the way in which it is metabolized in the body. This is extremely rare nowadays, as we have a much greater understanding through experience and knowledge of dyestuffs themselves. Some acid dyes are used to color food. We wear fabrics every day exposing our skin to dyes. The greatest risk of illness or injury due to dyes is by ingestion or exposure to dye dust. These scenarios are normally confined to textile workers. Although the dye itself may normally be nontoxic, its metabolic breakdown (usually in the liver) may produce the original intermediates used in manufacture. Many intermediate chemicals used in dye manufacture have been identified as toxic and their use has been restricted. There is a growing trend among governments to ban imports of dyes synthesized from restricted intermediates. For example, the dye CI Acid red 128 is banned in Europe, as it was found to metabolize in the body back to ortho-toluidine, one of its chemical intermediates. Many intermediates used in dye manufacture, such as o-toluidine and benzidine, were found to be carcinogenic. All major chemical companies have now ceased to market these dyes. Some, however, are still produced, but they have been found to be totally safe when on the fiber in its final state. The use of these dyes is declining rapidly, as cheaper and safer alternatives are now readily available. Delamare, Guineau, and Ber Francois. 2000. Colors: The Story of Dyes and Pigments. New York, NY: Harry N. Abrams. ISBN 0810928728. Richards, Lynne, and Ronald J. Tyrl. 2005. Dyes from American Native Plants: A Practical Guide. Portland, OR: Timber Press. ISBN 088192668X. Noble, Elin. 2003. Dyes & Paints: A Hands-On Guide to Coloring Fabric. Freetown, MA: Elin Noble. ISBN 0972825207. Dyers and Dyes in Oriental Rugs. This page was last modified on 10 February 2016, at 21:29.